Every town in the Philippines, no matter how big or small, holds a fiesta. Traditionally, the fiesta is a time of joyful celebration for Filipinos, who cook heaps of hearty food, throw open their doors to visitors, and parade in the streets. Some Filipino fiestas have evolved into elaborate, multi-day festivals, while others have kept their community roots. Here, we list the best fiestas across the Philippines. Panagbenga means ‘season of blooming’. This annual flower festival is held in February in the mountain-top city of Baguio, on the island of Luzon. Visitors flock to Baguio to watch the Sunday parade that works its way along Session Road. Dancers wear flower-themed costumes, and huge floats decorated with hundreds of blooms are pushed through the streets. The festival is especially significant for Baguio, as it symbolizes the city’s recovery from a devastating earthquake that took place in 1990. Bacolod’s Masskara is the closest thing the Philippines has to a carnival. Held around October 19 every year, the festival is a major event on the island of Negros. Masskara was born in the 1980s, after several years of hard times in the local sugar cane industry. The colorful, smiling masks worn during the festival reflect the Filipino attitude of good cheer in spite of adversity. People gather from all around the Visayas region to celebrate in Bacolod. A parade of dancers, wearing bright costumes and festive masks, troops through the city center, and in the town plaza, pig catching and pole climbing competitions are open to everyone. You haven’t really seen a Filipino fiesta until you’ve seen Sinulog. Held on the third Sunday of January in Cebu City, Sinulog celebrates the Christ Child, the ‘Santo Niño’ with three days of street parades, a procession of boats on the Mactan Strait, and early morning masses in the historic Basilica del Santo Niño. From a simple street dance (the word ‘sinulog’ describes the movement of water) Cebu now takes its annual fiesta to new heights. Visitors from all over come to celebrate with the Cebuanos in all-night raves, and to watch the parades and floats as they pass through the city. One of the Philippines’ best fiestas, Iloilo City’s Dinagyang manages to put on a world-class show while still holding tight to its cultural heritage. Dinagyang takes place on the fourth Sunday of January. Roads in the center of town are closed off to traffic to allow everyone to watch the Ati-Ati Street Dancing and Kasadyahan Parade. The mood is extremely festive, as dance troupes from Iloilo’s schools and colleges go all out to win the first prize. At night, Iloilo transforms into a big street party. Locals eat barbecue, drink and socialize, while live bands entertain the crowds. Firework shows and beauty contests are regular features of modern-day Dinagyang. The tiny town of Kalibo in Aklan takes its fiesta very seriously. Ati-atihan is said to have come about when the indigenous Aeta tribe gave refuge and sold parts of their land to 10 Bornean Datus. Later on the Datus returned the favor by providing shelter and food to the Aetas during a year of famine. For both events, the Aetas held a celebration. The fiesta in Kalibo still has deeply religious and tribal roots. Dancers cover themselves with soot to mimic the dark skin of the Aetas, and play drums in the streets. In homes all over the city, locals enjoy a few days of holiday feasting and socializing with friends. Ati-atihan takes place every year in January. The province of Quezon on Luzon Island has one of the most interesting fiestas in the Philippines. 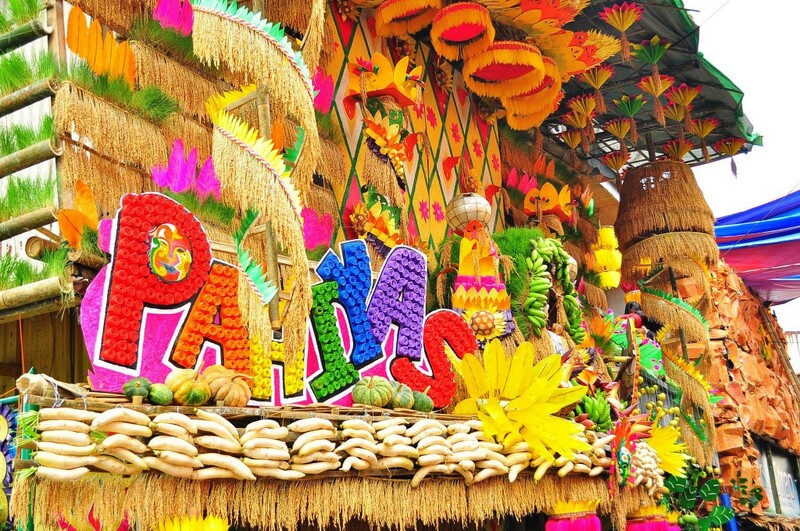 On May 15, Lucban and the towns nearby decorate their homes with fruits and vegetables in honor of San Isidro Labrador, the patron saint of farmers. A walk through the town reveals houses covered in all types of fresh produce. The festival is a way of giving thanks for a bountiful harvest, and the best-decorated house wins a prize. Toward the end of the festival, visitors are allowed to bring a basket and pick the fruits and veggies from the houses for free. One of the best Philippine fiestas for culture lovers to attend, Kadayawan showcases the gorgeous island of Mindanao. The word ‘kadayawan’ comes from ‘madayaw’, meaning ‘valuable’ or ‘beautiful’. The festival, held in the third week of August, brings together all that is beautiful in Davao City, with a week-long food fiesta, trade fairs and exhibits, ethnic dances, and a famous floral float parade. Kadayawan is the best time to see the unique tribal costumes and experience the rich culture of Mindanao.